Anyone with an online presence will most likely have heard of Bitcoin in all its cryptocurrency glory, but the question is – how much do they know about it? This secure, digital currency has no centralised institution controlling how it’s used or where it goes so it was always inevitable that some insane things were going to happen. From lost Bitcoins to buying two 5,000 Bitcoin pizzas, you can always trust people all across the globe to use this unusual, expanding currency in the most insane ways. 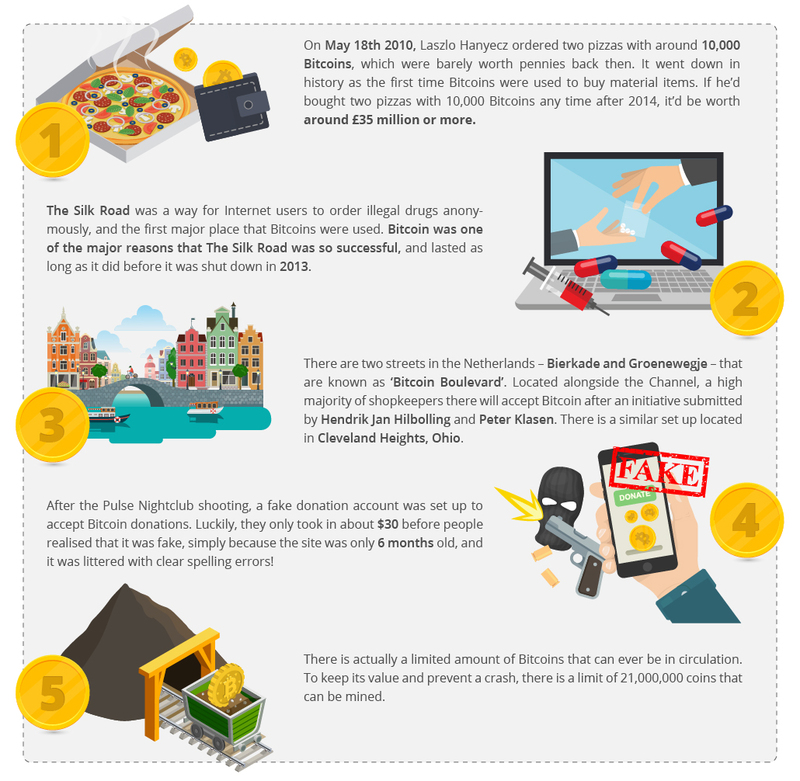 And so, of course we’ve looked deeper into some of the most insane facts about Bitcoin, and how it’s being and has been used worldwide! Barely anyone knew about Bitcoin back in 2010, and those that did could never have predicted how fast it’s grown in worth. Laszlo Hanyecz posted on the Bitcoin Talk forum in May 2010 writing that “[he would] pay 10,000 bitcoins for a couple of pizzas… like maybe 2 large ones so I have some left over the next day.” Little did he know, those bitcoins would be worth far more than two large Papa John’s pizzas now, with 10,000 bitcoins being worth around £35million. But Bitcoin’s worth hasn’t just shocked Laszlo Hanyecz. The Silk Road was once a way for internet users to order illegal drugs anonymously, but was shut down by the FBI in 2013. They seized 144,000 Bitcoins, which were worth about $28.5million at the time. But where do you spend all of these valuable Bitcoins? Bitcoin Boulevard in the Netherlands is rightly named due to its collection of shops and merchants that will now, as of March 2014, accept Bitcoin as legitimate payment for their goods and services, making Hague in the Netherlands a hotspot for Bitcoin enthusiasts too. After the tragic shooting at Pulse Nightclub in 2016, a fraudulent site was set up, claiming to be accepting donations for the victims and their families. However, the site was quickly shut down after only gaining about 0.04293381 bitcoins, which is about $30. They weren’t even close to the 21,000,000 limited number of Bitcoins to ever be in circulation! If there were an unlimited number of Bitcoins available, after all, they’d lose their worth, and so the amount that can ever be produced has been effective capped. If you happen to get involved in Bitcoin, make sure you remember your Bitcoin Wallet Key, or you’ll lose your money forever! It’s estimated that over 25% of Bitcoins have been lost forever and up to 65% of the world’s Bitcoins are still inactive. This isn’t even including the ones that haven’t been mined yet! James Howell, a Welsh man, can be held accountable for the loss of 7,500 of those Bitcoins! Having stored them on a hard drive back when they weren’t worth very much, these bitcoins are now worth around 26million, but he has no hope of getting them back. If the hard drive is even still useable, you’d need to dig through five foot or more of rubbish to reach it. Another lot of Bitcoins that are currently sitting unused are the FBI’s collection of The Silk Road’s Bitcoins. They are slowly starting to release these back into the Bitcoin cycle, however, auctioning them off in batches slowly to avoid a complete market crash that could ruin the worth of Bitcoin. Merchants all over the world are starting to accept Bitcoin, but did you know they can be used for material items? 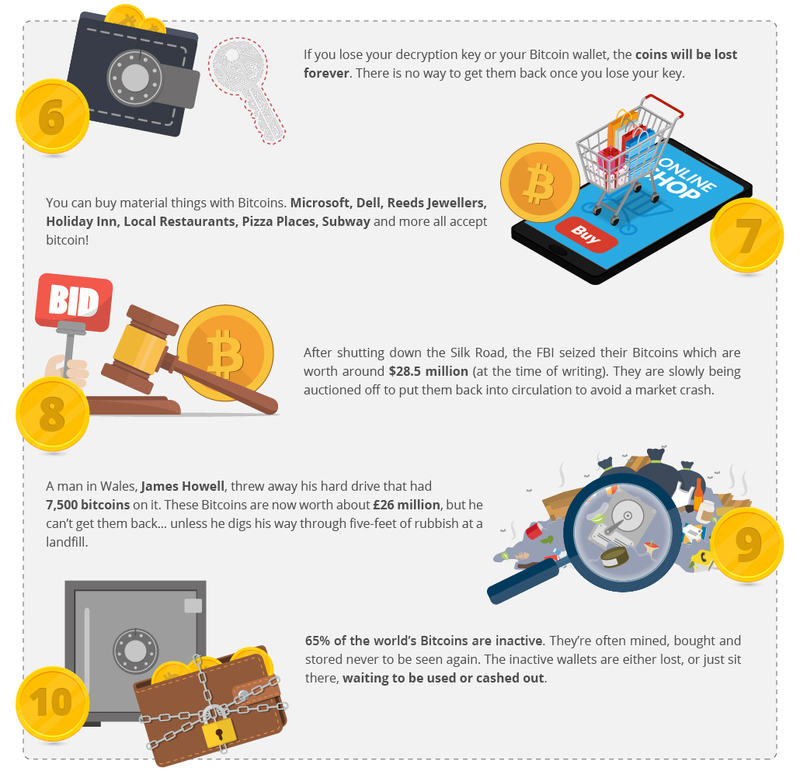 Microsoft, Dell, Reed’s Jewellers and Holiday Inn are just a few of the big names that are accepting Bitcoins. You can even buy a footlong sandwich from Subway using your cryptocurrency! 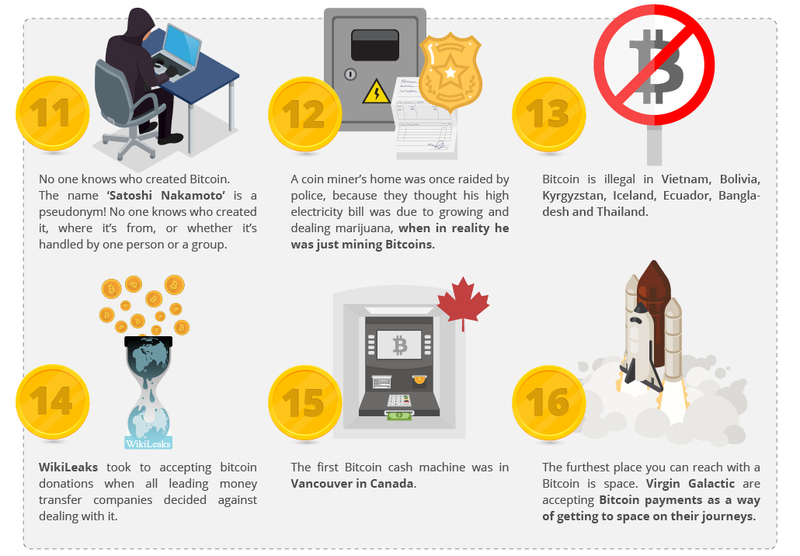 Beyond the pseudonym ‘Satoshi Nakamoto’, no one truly knows who created Bitcoin. Cag Wright, an Australian Entrepreneur, has claimed to be the mysterious figure, but no one knows for sure, and many people are still sceptical! The mystery around Bitcoin goes beyond not knowing its true creator, with some countries even making his cryptocurrency illegal in an attempt to rid the countries of the confusing, unregulated currency! WikiLeaks even began to accept the currency simply because no other money transfer companies would agree to work with them when it came to accepting donations for their site. A coin miner’s home was even raided by police when they thought his high electricity bill was due to growing marijuana. Bitcoin mining takes up an extortionate amount of electricity, and so the confusion is understandable! But Bitcoin is becoming more common. Virgin Galactic have even claimed that they will accept Bitcoin payments as a way to get to space. Virgin’s founder Sir Richard Branson has announces that his commercial space flights will begin to accept bitcoin as payment, and a flight attendant in Hawaii has since purchased the first ticket using Bitcoin. With Bitcoins even being available through cash machines, with the first being available in the city of Vancouver, Canada. Not only can you reach space using Bitcoins, but a Bitcoin can actually reach space too! In fact, it already has. Genesis Mining send a 3D Model of Bitcoin into space with a paper Bitcoin Wallet, which had been tied to a weather balloon and released. This journey was recorded using a GoPro, and once the balloon had reached 20 kilometres, then then later, 34 Kilometres, they made a transaction. Speaking of all things futuristic, it’s predicted that 2140 will be the year that the last Bitcoin to exist will be mined. Once this has happened, there will be no more Bitcoins available for mining, and no need for Bitcoin Miners. 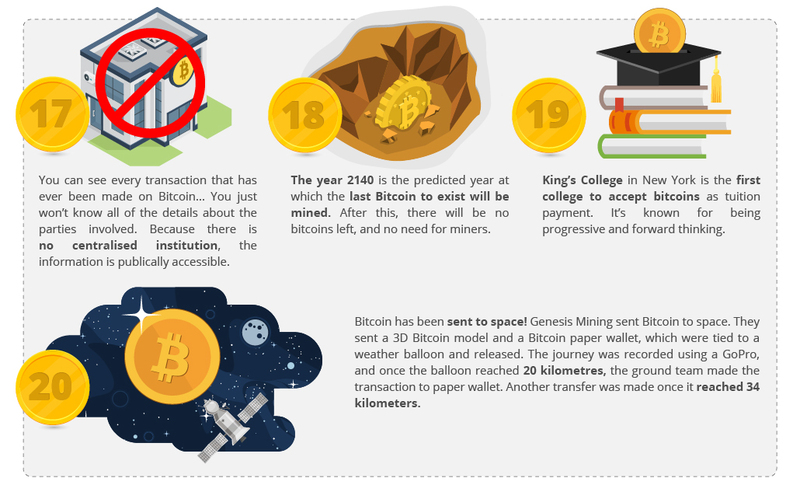 King’s College, NY is the first college to accept Bitcoins as a tuition payments. Then again, the college has always been known for its forward thinking and just how progressive it is. You can even go on to see your transactions through the Blockchain. After all, every transaction to ever be made through Bitcoin can be seen considering there is no centralised institution to control this kind of thing!